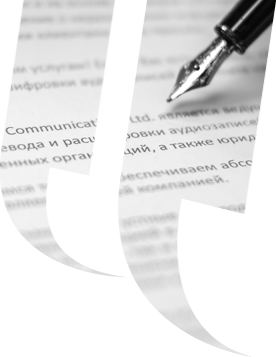 Communique provides accurate and reliable transcription services to many of the UK's most recognised private, legal and public sector organisations. Providing shorthand typists to attend meetings and/or work from audio to produce an initial summary and if necessary a more comprehensive document post event. Transcribing Police and Criminal Evidence audio in verbatim format and often delivering to our clients within time critical deadlines. We accept a wide range of audio formats and offer a secure upload facility from which we will download your audio and assign to our writers to produce a transcript that suits your requirements. Provision of highly experienced court reporters for attendance at criminal and civil hearings across the UK. Attendance of expert stenographers for criminal and civil hearings across the UK. Translating transcripts into over 100 different language combinations. All staff working with Communique both in house and subcontractors have signed our Non Disclosure agreement for confidentiality purposes and we are happy to review and sign the same provided by our clients at their request. For further information regarding our transcription services, please feel free to request a quotation or contact us.